Hope that you are all enjoying the start to Spring and April School Vacation. We just closed out an awesome 2018-2019 Wildcat Hockey Season. We would like to take a moment to express our most sincere gratitude for all that you did to support Wilmington Youth Hockey and the efforts of the Fundraising Committee throughout this past season. The hard work and time put into the various events that were conducted to provide the much needed funds to the program made a major difference this past season. THANK YOU! We could not have done it without YOU! With that, we are off and running to prepare for the upcoming 2019-2020 Season. The Fundraising Committee works in conjuction with the Board of Directors to deliver funds to support the players and teams. Our fun group of hockey parents and community members attend meetings throughout the year to map out the upcoming events and plan fundraising initiatives. We are currently looking for new members to join! Join us for the first meeting of the 2019/2020 Season on Tuesday, April 23rd @ 7PM. We will be sharing our goals for the upcoming season and begin the planning of the 2nd Annual Drop the Puck Street Hockey Tournament! Due to the success of last year's event we have expanded the event and will be taking over the entire grove and parking area of the Tewksbury - Wilmington Elks in Tewksbury. We will also hold festivities in the main hall! Thank you for your continued support. We look forward to coming together and enjoying another season of Wilmington Youth Hockey! We will be holding our Board Of Director Meeting tonight. As always, all are welcome to attend. We are looking for interested individuals in joining the Board to attend our upcoming meetings. We will hold our Annual Meeting in May to vote in new members, but if you are interested in learning more about the Open Seats - please stop by our meeting tonight. 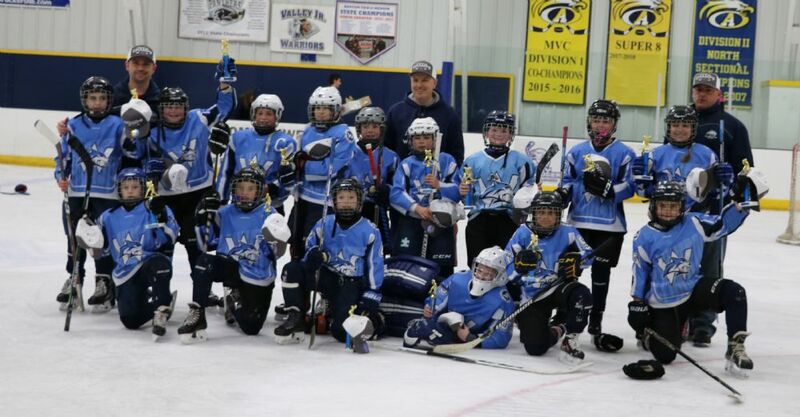 WILMINGTON, MA — On Saturday March 30, the Wilmington Squirt 2 team (21-6-1), won the Valley League Division Championship with a 6-1 victory over Methuen. The team entered the 2018/19 season with (8) kids who never played organized hockey before. Led by a core group of veterans, the team quickly formed a close bond and focused on teamwork, effort, and supporting each other. In the Championship Round, Wilmington’s opponent was the #2 Seed Methuen (16-10-2). Wilmington scored first with a defensive rush and a great pass from Dylan Minasian who followed it up with a breakaway goal of his own. Wilmington would not be denied this day, great two-way play was exhibited by Danielle Chillemi and Frank Cain, relentless back checking from Olivia Raposa, and “wall-like” defense from Nolan Harrison, Connor Jamieson and Dean Ciampa cemented their place as VHL Champions! As a demonstration of Wilmington’s sportsmanship and respect for Methuen’s efforts, after each player received their Championship trophy, they again individually shook the hands of each player and coach. Congratulations to this special group of kids and their remarkable season! As a fundraising initiative for Wilmington Youth Hockey, local Attorney Michael Newhouse is offering a discounted rate for an estate planning package. This package includes a Last Will and Testament, a Durable Power of Attorney, a Health Care Proxy, and a Living Will. The fee for a couple's package, with documents prepared for each spouse or partner, is $400.00. The fee for an individual's package is $300. One Hundred Percent of the fee will be donated to WYHA. 1. To maintain confidentiality, email Attorney Newhouse directly at and tell him that you would like to take advantage of this offer. 2. To qualify, your son or daughter must be a current member of WYHA, in good standing. 3. Attorney Newhouse intends to complete all packages by February 28th. 4. At the time that the work is complete, you will have the option of making payment directly to WYHA or if you prefer to maintain confidentiality, you can instead remit payment to Attorney Newhouse. In turn, he will entrust you with a check payable to WYHA, and ask you to remit payment on his behalf. 5. Attorney Newhouse reserves the right to decline any prospective client if it would result in a conflict of interest.